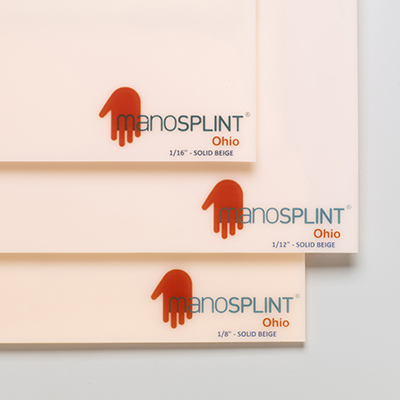 Manosplint Ohio material is a coated material that will not adhere to itself until the coating is removed. Ohio becomes translucent when it is heated, allowing the therapist to clearly see target areas and minimize patient discomfort. Dimensions: 18" x 12" x 1/16""
Dimensions: 24" x 18" x 1/16""
Dimensions: 18" x 12" x 1/12""
Dimensions: 24" x 18" x 1/12""
Dimensions: 24" x 18" x 3/32""
Dimensions: 18" x 12" x 1/8""
Dimensions: 24" x 18" x 1/8""